Home Tags Articles tagged with "ihop"
The newest breakfast chain to express interest in serving up business in Maricopa appeared in front of a city board Wednesday afternoon at City Hall. But, before planning department forwards the project for city council approval, representatives for the International House of Pancakes requested changes to a few of the city’s design requirements. 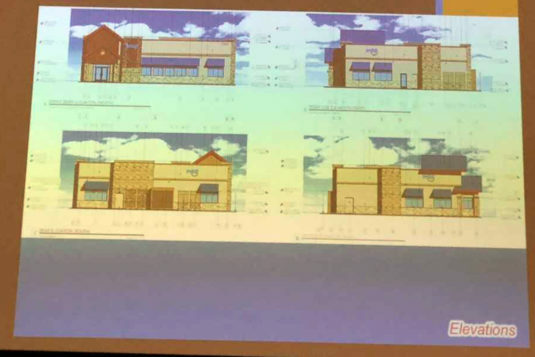 The full-service, 4,764-square-foot restaurant is planned on the southwest corner of the Edison Pointe retail center. A possible opening date was not discussed. 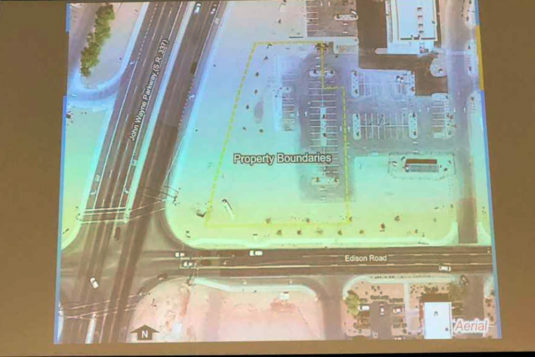 The Board of Adjustment heard arguments from IHOP representative Taylor Earl of Earl, Curley and Lagarde, a zoning and land use law firm in Phoenix. 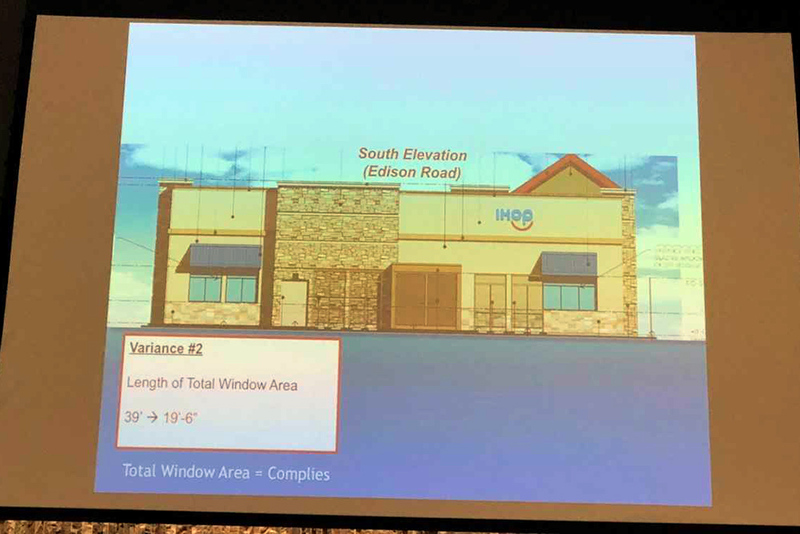 Earl requested the Board approve design changes that affect the restaurant’s proximity to nearby roadways, as well as the number, location and transparency of windows. 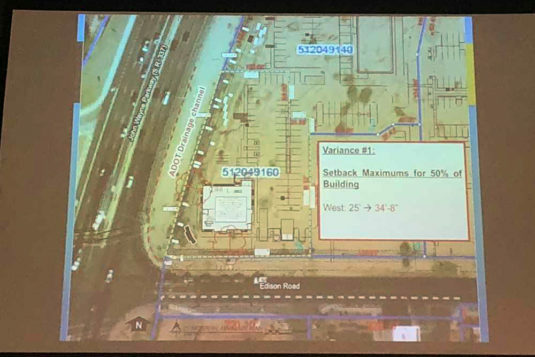 Earl said special circumstances warranted variances to certain commercial building zoning codes. 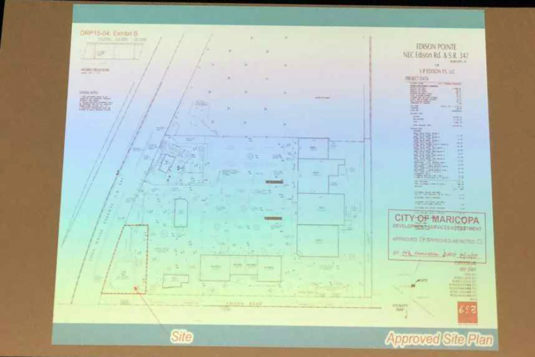 The layout of the 1.18-acre parcel of land where IHOP plans to open is “quirky,” according to Earl. 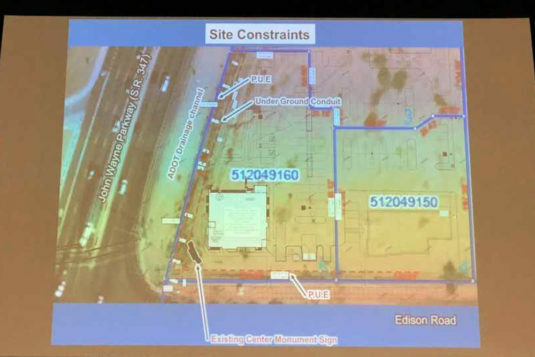 A large drainage channel, existing “monument” signage and public utility structures contribute to IHOP’s request to build the structure farther from Edison Road and John Wayne Parkway. Rodolfo Lopez, senior planner with the City of Maricopa, said zoning code requires businesses to build close to main roadways. Large, transparent windows aid in visual appeal, Lopez added. “Its purpose is to promote an environment through architectural and urban form design,” Lopez said. The parcel, through the city’s zoning code specifications, would frame John Wayne Parkway and “celebrate” the building’s architecture. Earl argued the parcel’s topography and shape make that difficult. The westside features a sloping property line, and its northeast corner includes a “notch out,” or irregular shape, Earl said. 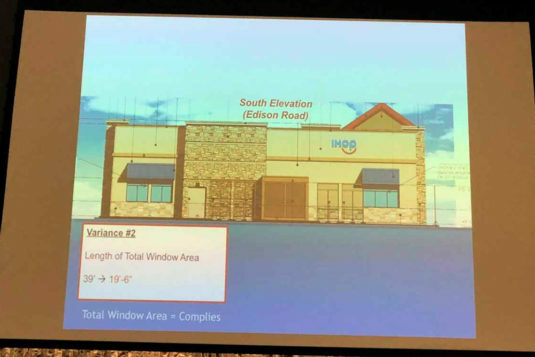 IHOP wants to limit the number of windows the city requires, mostly because of where the building would be situated on the parcel. Future patrons will enter the restaurant on its north end, nearest its parking lot. Earl explained the kitchen will face south toward busy Edison Road. The city prefers those windows exposed to roadways be transparent in an effort to embrace “people viewing” and window shopping, Lopez said. 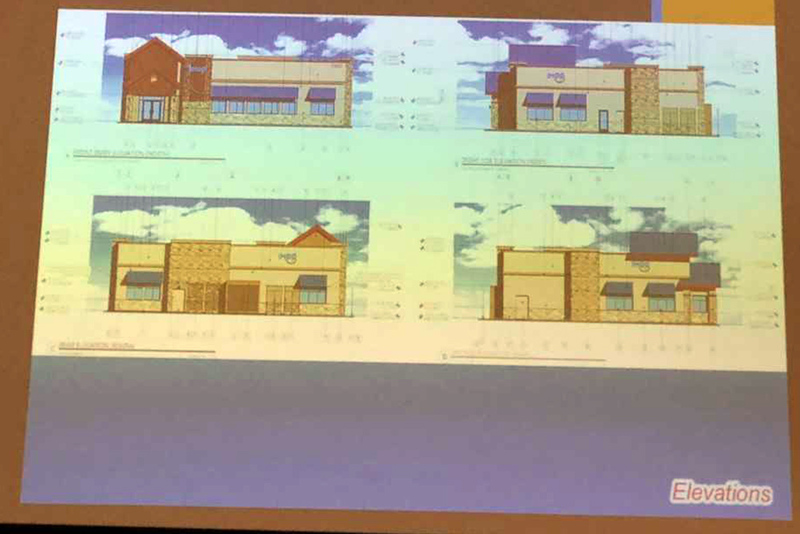 However, Earl argued a clear view inside the kitchen and other back-of-house operations goes against the aesthetic intent incorporated in city zoning codes. Earl also said current zoning would compromise the structure’s integrity and argued a need for fewer windows. With those changes, the IHOP rep said the new eatery will still be easy on the eyes. “I can tell you that this architecture is very well designed,” Earl said. Board members passed IHOP’s requests in a 5-1 vote, with Vice Chair Thaddeus Holland opposing.